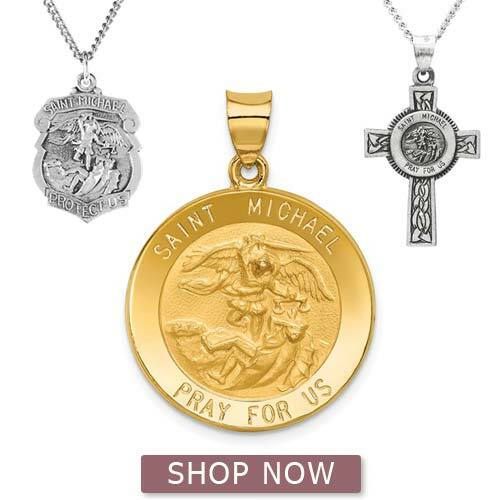 When it comes to the meaning of St. Michael medals, there are a few things worth knowing. A stylish choice, it is also symbolic for many. While this saint can be worn by anyone seeking protection, it is typically known as the go-to medal for those in law enforcement. These are a great gift for those just entering or graduating from the academy, or as a special occasion gift for the police officer in your life. While the St. Michael medal is now synonymous with the police profession, there are a few things to know about the history of this figure. A symbol of the battle and perseverance of good against evil, Saint Michael is portrayed in the bible fighting and defeating Satan in the book of Revelations. Since he is seen as the epitome of certain values upheld by police, such as honor, duty, and goodness over evil forces, it makes perfect sense for St. Michael's medals to hold meaning for law enforcement professionals. This archangel even has a specific prayer attributed to his protective nature which many police officers have memorized by heart. and all the evil spirits, who prowl about the world seeking the ruin of souls. The depiction of this saint is usually with angel wings with a sword raised in one hand and a shield in the other hand. He is depicted standing on the back of a beast, believed to be a representation of Satan. Another element often seen in St Michael medals is the phrase, "Pray for Us", which is used to ask him to watch over the wearer of the medal. We offer several options for this type of accessory. Whether seeking a smaller medal or a larger, more dramatic one, we have a range of styles available. While the rounded medal is always a popular style choice, many people prefer the shield shape which adds to the police officer element. They are also offered in styles with carefully carved pendants to outline the angel on the dragon for those looking for a style without the medal aspect. Regardless of which style you choose, they make thoughtful gifts for the ones sworn to defend and protect!